Parking spot squatting - an international phenomenon? South Boston was in the news after this week's snow storm for the local practice of informally (and illegally but apparently legally) reserving on-street parking spots. When there is snow on the ground, the person who digs out an on-street parking spot treats it as theirs for a day or two or until the snow is gone. They mark their space with household objects, as reported in the New York Times which has a photograph of a colourful beach chair sitting incongruously in a wintry street scene. Something similar happens all year round in tropical Southeast Asia, including in Singapore, Kuala Lumpur and Bangkok. Clearly snow is not a factor here! In Singapore this seems to happen in low-rise residential areas (wealthy places in the Singapore context) where on-street parking is not priced and where spaces are not formally marked out. Singapore has no residential permit system for such areas. 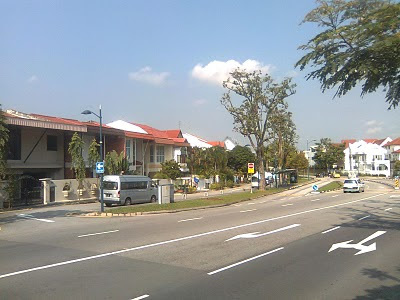 The residential streets shown in these pictures are in prosperous Serangoon Gardens close to commercial activity (especially restaurants busy in the evenings) on Yio Chu Kang Road. These photos were taken in the late afternoon. Reserving parking like this might seem brazen (I guess it is) and it is certainly illegal [Update: in the Southeast Asian cases it is illegal]. And I don't necessarily think it is widely accepted as a reasonable thing to do. As the reports on Boston make clear, many frown on this practice but that doesn't make them bold enough to actually move the objects and park there anyway. [Update: In the South Boston case, using objects to save spaces seems to have at least some legal status. The City of Boston website says it will only remove such space-savers 48 hours after a snow storm.] And Even where it is unambiguously illegal, how many people will take the trouble to report this to the authorities? Very few it seems. In South Boston, snow and the effort of digging out a space enhances the sense of righteousness in claiming the spot. 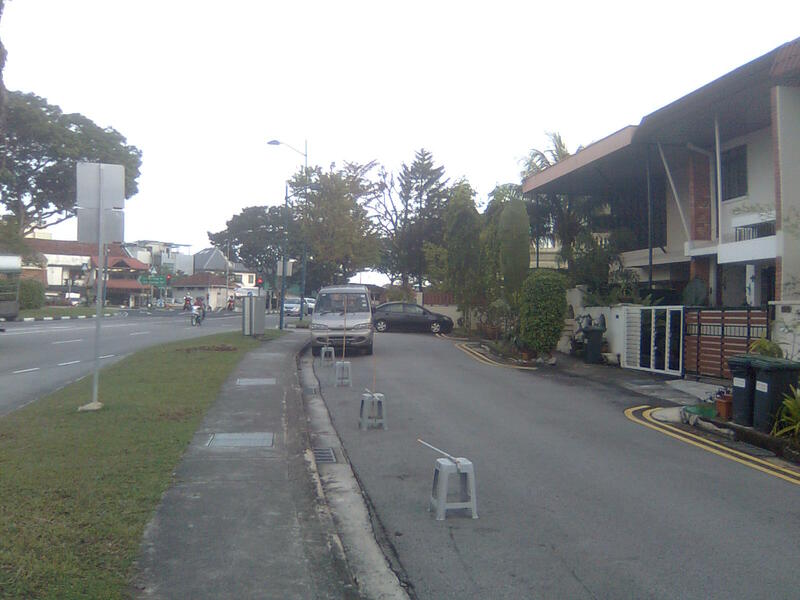 In certain places in Singapore, it seems some residents feel justified in claiming these spaces every evening. 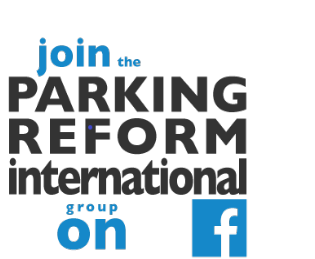 My guess is that residents informally reserve "their" on-street parking spaces in many cities around the world, if they can get away with it, and if they feel they need to. Does this happen in your town? In what specific circumstances? Have you heard of good solutions? I wonder how many cars does each of those households own. 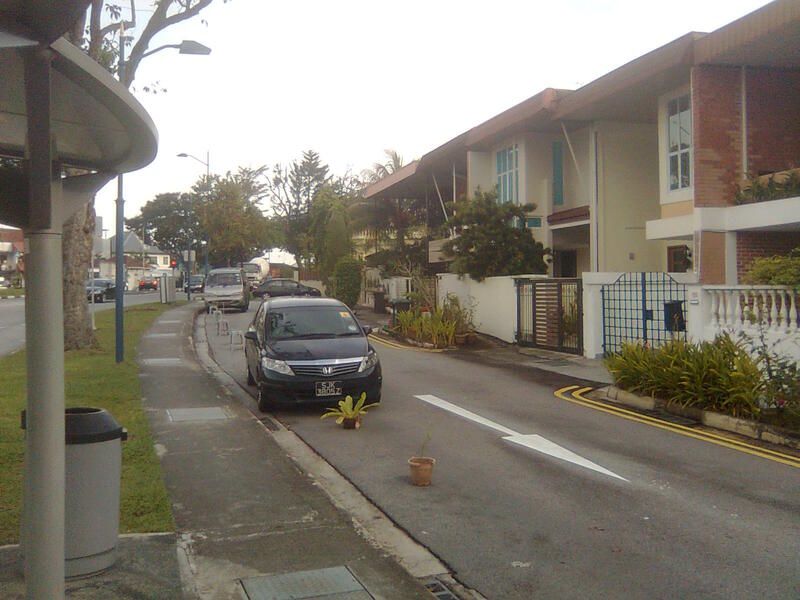 If it's one car per household, the owners are just plain lazy not to park in the porch. Otherwise, you might want to suggest the proof of parking policy or a 2nd car duty to the government. So as not to misinform your readers about 'reserved parking spots' being illegal: South Bostonians are well within their right to reserve parking for up to 2 days - which completely contrasts your opening paragraph. I found this after spending 10 seconds on google. •Any "space savers" left in on-street parking spaces that have been shoveled out must be removed 48 hours after a snow emergency has ended. Thanks @anonymous for the clarification about South Boston that it is legal to reserve parking spaces after a snow storm. I guess I didn't read that NYT item carefully enough. Correcting the post now. I find I am still a little confused about the legalities of the South Boston case. Yes, it appears that the City recognizes the practice of reserving spots with space saver objects and does not mess with them until 48 hours after the snow emergency. But it is not crystal clear to me that the practice is fully legally sanctioned either. Users of space savers don't appear to have any mechanism to really enforce their reservation except an appeal to a sense of fairness (or an implicit threat).